MPress Records has earned favorable pre-release Newsradio and music press coverage for ‘New Arrivals Volume 4’ – a June 7th charity compilation CD to benefit The National Network For Youth, whose mission is to champion the needs of runaway, homeless and other disconnected teens. Praise is already coming in for standout tracks like those from American Idol finalist Caleb Hawley, acclaimed Verve artist Lucy Woodward and 2011 Grammy nominee Dave Eggar. On the syndicated New York News Connection, a statewide news service for New York, veteran Producer Mark Scheerer aired a segment entitled ‘Who Wants to Help Homeless NY Teens? Charity CD Tries to Counter Cutbacks, Recession’. A GLITTERY EVENING OF AWARDWINNING ARTISTS FEATURED ON THE “NEW ARRIVALS” COMPILATION SERIES, BENEFITING THE NATIONAL NETWORK FOR YOUTH (NN4Y). 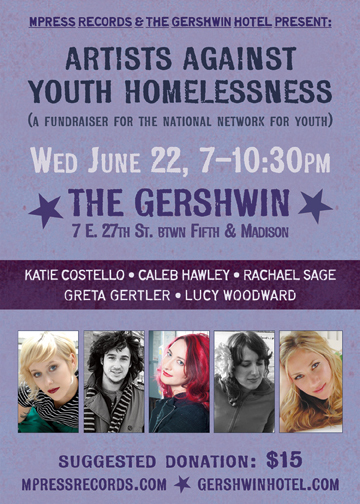 LUCY WOODWARD, CALEB HAWLEY, RACHAEL SAGE, GRETA GERTLER, & KATIE COSTELLO! Sage expects additional launch parties to be announced in the weeks ahead. Visit www.newarrivalscd.com for up-to-date information. New York News Connection - "Who Wants To Help Homeless NY Teens? Something Else - "Half Notes: Avi Wisnia, "New Year" 2011"
Something Else - "Half Notes: Light in August, "Northern Lights" 2011"
The New York Times - NAV4 Artist Michelle Citrin also making headlines for writing the music & lyrics for the upcoiming "Sleepless In Seattle Musical"
MPress Records was founded a decade ago by New York based art-pop chanteuse and keyboardist Rachael Sage, who has toured with Ani DiFranco and Lilith Fair and shared stages with Sarah McLachlan, Marshall Crenshaw, Judy Collins and The Animals. Sage, who performs over 150 dates a year in the U.S., Europe, Asia and The Middle East, has received numerous songwriting accolades including Grand Prize in the John Lennon Songwriting Contest, as well as several OUTMusic and Independent Music Awards. Recent MPress releases include Sage's ninth album 'Delancey Street', as well as rising newcomer Seth Glier's award-winning album, 'The Next Right Thing'; the label will also be releasing indie maverick (and major label veteran) Melissa Ferrick's next album in Fall 2011. The National Network for Youth has been serving the youth of America for more than 30 years by championing the needs of runaway, homeless and other disconnected youth. We do this through advocacy, innovation and services. Our reach is extended through our member organizations, allowing us to be in numerous communities throughout the country as we create a neighborhood of support for the next generation. Our members are community-based organizations along with their neighborhood youth, adults, associations, and regional and state networks of youth workers. These builders of the future provide street-based services, emergency shelter, transitional living programs, counseling, and social, health, educational and job-related services to over 2.5 million youth each year. The National Network is committed to ensuring that opportunities for growth and development be available to our neighbors everywhere. The youth we work with face greater odds due to abuse and neglect, homelessness, lack of resources, community prejudice, differing abilities and other life challenges. National Network for Youth envisions a world where vulnerable youth have a safety net everywhere they turn — therefore creating positive and strong communities one youth at a time.